Developments and Applications for ECG Signal Processing: Modeling, Segmentation, and Pattern Recognition covers reliable techniques for ECG signal processing and their potential to significantly increase the applicability of ECG use in diagnosis. 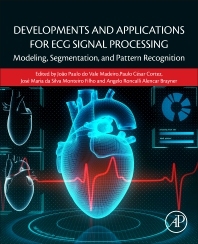 This book details a wide range of challenges in the processes of acquisition, preprocessing, segmentation, mathematical modelling and pattern recognition in ECG signals, presenting practical and robust solutions based on digital signal processing techniques. Users will find this to be a comprehensive resource that contributes to research on the automatic analysis of ECG signals and extends resources relating to rapid and accurate diagnoses, particularly for long-term signals. Chapters cover classical and modern features surrounding f ECG signals, ECG signal acquisition systems, techniques for noise suppression for ECG signal processing, a delineation of the QRS complex, mathematical modelling of T- and P-waves, and the automatic classification of heartbeats. 6. Mathematical modelling of T-wave and P-wave: a robust alternative for detecting and delineating those waveforms. João Paulo do Vale Madeiro is Professor at the Institute for Engineering and Sustainable Development (IEDS), at the University for the International Integration of the Afro-Brazilian Lusophony, (UNILAB), Brazil. His research focuses on digital signal processing, computer-aided diagnostic systems, automatic ECG parameter extraction, and the application of non-linear techniques for cardiac signals. He has published widely in leading international journals, and presented at numerous national and international conferences. Paulo César Cortez is Full Professor at the Department of Teleinformatics Engineering at the Federal University of Ceará (UFC). His research focuses on artificial vision, primarily on 2D and 3D contours of polygonal modeling, pattern recognition, digital image segmentation, digital signal processing, biomedical imaging, computer-aided intelligent systems for biomedical signal analysis, telemedicine applications, and embedded systems. He has published widely in leading international journals, and presented at national and international conferences. Dr. José Maria da Silva Monteiro Filho holds a Bachelor's Degree in Computer Science from the Federal University of Ceará (1998), a Master's Degree in Computer Science from the Federal University of Ceará (2001) and a PhD in Computer Science from the Pontifical Catholic University of Rio de Janeiro (PUC-Rio). He has experience in Computer Science, with emphasis on Database and Software Engineering, working mainly on the following topics: automatic tuning of databases, cloud databases, linked data on the Web and software quality. Angelo Brayner graduated in Computer Science in 1988 from the Federal University of Ceará (UFC). In 1994, he obtained a Master's Degree in Computer Science from the State University of Campinas (UNICAMP), under the guidance of Profa. Dr. Cláudia Bauzer Medeiros. In 1999, he completed his doctorate in Computer Science by the Universität Kaiserslautern, Germany, under the guidance of Prof. Dr.-Ing. Theo Härder. He is currently an adjunct professor at the Federal University of Ceará. In 2014, he taught a course at the University of Stuttgart (master's program - IMSE), Germany, as a visiting professor. He is the author of the book Transaction Management in Multidatabase Systems, published by Shaker-Verlag, Germany, in 1999. Prof. Angelo Brayner is the author of more than 50 articles published in international and national journals and conferences.